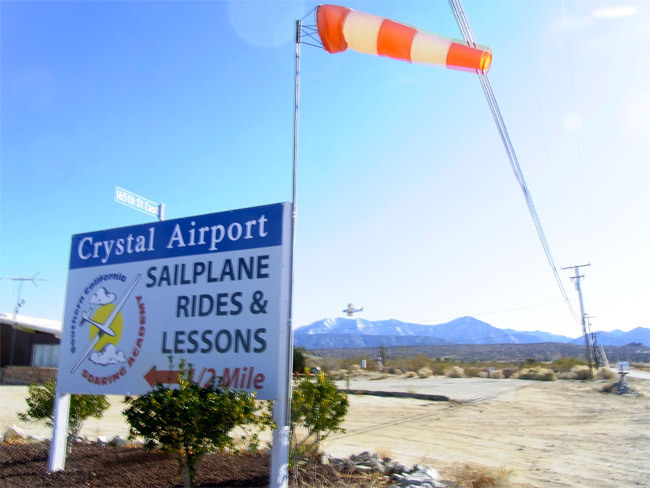 Southern California Soaring Academy is the premier glider flight school in Southern California and is located at Crystalaire airport (46CN) in the high desert of Los Angeles, just over 1 hour driving time from L.A.
At Crystalaire nearly everyday is flyable. Tucked against the north side of the San Gabriel mountains the best year round soaring in the U.S. is found here. We are the only glider port in L.A. County. Take the Hwy 138 exit toward Palmdale. Continue on Hwy 138 about 26 miles. Turn Left on 165th Street E.
Take the Palmdale Blvd, Hwy 138 East exit. Continue on Hwy 138 East for 5 miles until 47th St. E.
Turn Right to follow Hwy 138. Continue on Hwy 138 for 15 miles. Watch for our sign on the corner.